Thus, Zeitgeist was born! It’s the pub quiz you can join in from your sofa – you don’t even have to take your slippers off! Using the mighty power of Mixplay and Mixer’s sub-second latency we could ask general knowledge questions and give viewers 10 seconds to answer – so there was no chance for cheating by giving them time to google anything! If we had used any other streaming platform – where the delay can be 6-7 seconds – this would not have worked, as by the time they had read the question and answers they would have run out of time to press the correct answer. Originally, we saw it as a way of marketing Interference – as the way we chose the topics for the 5 rounds of general knowledge was by picking our favourite 5 drawings from each week’s games. 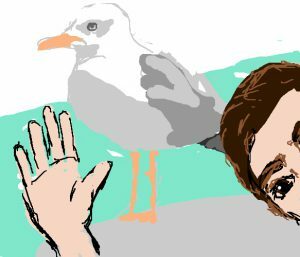 So if someone had drawn a particularly awesome seagull, for example, we might have a round on sea birds. Part of the fun during the quiz is the players guessing what the next round is about from the picture at the start! So, the way it works is that we have 5 rounds of general knowledge – each with 5 questions. Each question is multiple choice – so you choose the correct answer (hopefully!) from four possible options. At the end of each round there is a leaderboard – and as we go through the rounds the scores are accumulated onto the main leaderboard – so we can see who has got the highest score so far. It is hosted by myself and Nathan and we enjoy the interaction in the chat, the banter between the quizzers and the friendly competitiveness it fosters. We have got an audience of all ages – from all over the world, and we like to think that the quiz brings whole new audience to Mixer. It is pretty exciting most weeks as we quite often get to the final question to decide the winner. One week we even had a dead heat between two of the regulars. 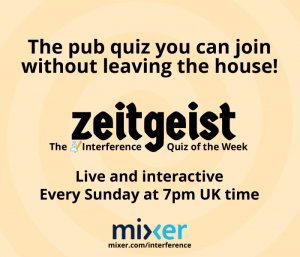 We think that it is the first live quiz on the Mixer platform. We feel that there are a lot of people who would love to join an actual pub quiz – but can’t go out for various reasons (kids, disability, no friends available) so can join in from wherever they are from any device. Everyone loves a quiz but instead of watching The Chase or Who Wants to be a Millionaire and just shouting at the TV – you can actually take part. It’s like social television – what’s not to love? In our next blog post we’ll be talking about how we now build interactive features into our games from the start – rather than adding them in as an afterthought. We will show the example of our latest game in progress – Rogue Drones.